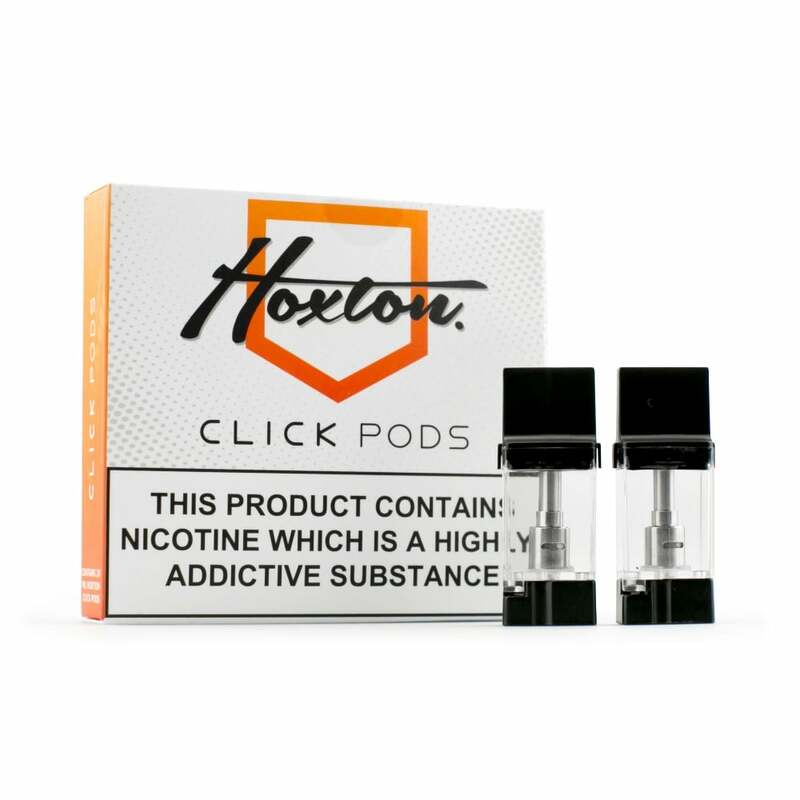 Ensuring you never run short of the pods needed to keep your Hoxton Click Kit in good working order, you can pick up two packs of replacement Hoxton Click Pods here. The pods hold 1ml of your chosen e-liquid and slot with ease into the Hoxton Click Kit. Each individual cartridge for the Hoxton Click Kit holds 1ml and always having a spare means you can keep yourself topped up in every circumstance. All Hoxton Click Pods are of the same high quality as those originally provided with the kit and work in exactly the same easy and convenient way. How long will this clearomizer last before it needs replacing? A clearomizer itself will last for anything up to six months as long as it is kept well protected. The coil within it, however, will last approximately 2-8 weeks depending on use. After this time it will 'burn out' (ie reach the end of its lifespan). After your coil has burnt out, you will either need to change it (if spare coils are included), buy a new clearomizer (if the clearomizer is disposable), or buy a pack of replacement coils. What can I say. They fit well and seem well made. Don't leak. Excellent product that deserves mentioning. Although quite expensive these items are reliable and last a good while. These clock pods are absolutely brilliant! I would highly recommend trying the hoxton vape as it is amazing! Such great value for money and the service you get from ET is second to none!! Highly recommended and buy with confidence. All my friends now use this site and but their vape products from ET! Absolutely brilliant!!!! Very well made and it's so easy to fill. Fantastic product. GREAT PRODUCT, THEY LAST FOR AGES AND SO SO EASY TO FILL UP AND REALLY HANDY. I HAVE USED ABOUT 30 DIFFERENT VAPES OVER THE LAST 4 YEARS OF VAPING, AND THIS IS FAR THE BEST. I USED TO SUB OHM, BUT THESE WEE BITS OF GREATNESS MEAN ENOUGH SMOKE BUT SO DISCREET!! JUST UP THE STRENGTH ON THE JUICE, GREAT FLAVOUR AND SERIOUSLY THE BEST WEE VAPE DEVICE I HAVE EVER HAD AND THESE WEE BABIES ARE BRILL!!!! The click pods arrived well boxed and they are so easy to fill. Simply twist the bottom and fill them to the top. Every one I have had is exactly the same and the quality of the product is so good.